Authentic, original campaign button. 3 1/2 inches in diameter. 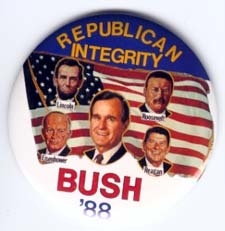 Flag and color photo of flag and Republican leaders with white stars and yellow, red, and blue lettering "Republican Integrity 41st Bush '88." All buttons are in good vintage condition.